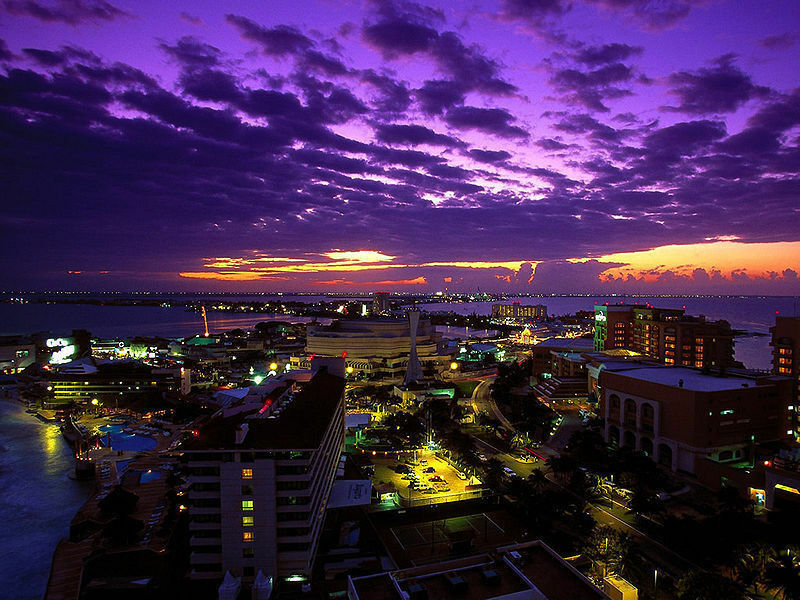 Sunset over the Cancun peninsula. Cancun, Mexico means white sand beaches, tropical vistas, luxury resorts, and some of Mexico’s most historic sights, making it one of the hottest spots for a family vacation by the sea. And while Mexico’s Mayan ruins are an essential stop, the top-of-the-line resorts along Cancun’s Zona Hotelera (the Hotel Zone) are almost destinations in themselves. We’ve been to most of them and we’ve come up with a list of the very best Cancun resorts and Cancun all-inclusives for families. To help you make the most out of your family vacation planning, keep in mind that pristine beaches, sun-filled pool decks, bounteous food, and a relaxing spa come standard at almost every Cancun hotel or all-inclusive resort. You’ll find that pricing varies according to the quality of the food and liquor (lobster nightly or premium brands), size of rooms, and proximity to the waterfront. You’ll also find that many resorts have “sister” properties whose facilities you can use at no extra charge. So please read on. We’ve tried to highlight what we find are the unique features that push these Cancun hotels and resorts to the top of the pack. 1) Club Med Cancun Yucatan – If you’re planning a family reunion where all ages (and all budgets) have a comfy room, limitless healthy food, and enriching recreation programs, at an all-inclusive resort that provides every comfort while promoting the region’s many cultural attractions, look no farther than the newly refreshed and expanded Club Med. 2) CasaMagna and J.W. Marriott Cancun Resorts – Among these two lush Marriott resorts in Cancun, the CasaMagna is a great choice for family fun on a budget. It offers all the same vacation packages, business amenities and services as the more upscale J.W. Marriott — which is certainly more luxurious. The big difference for families who are out all day will be the price. 3) Crown Paradise Club Cancun – With an award-winning nursery program for babies, lots of activities and a club for kids, a private teens lounge and five swimming pools with waterslides, there is guaranteed fun for families at this all-inclusive resort. It may not be the fanciest and its buffets won’t wow the foodies, but CPC delivers a great beach vacation at a great price. 4) Gran Caribe Real Cancun – Living up to their promise to “exceed your expectations,” this all inclusive resort has some really amazing family of five rooms. Another great reason to stay: There’s an onsite water park. 5) Mia Resorts of Cancun – If you’re looking for a hacienda-style a la carte apartment, or a total getaway to the white sand beaches of Isla Mujeres, the small Mia Resorts group has two value priced options for you and the family. 6) Iberostar Cancun Hotel – With a bigger is better attitude, the all-inclusive Iberostar (formerly Cancun’s Hilton Hotel) offers families the longest stretch of private white sand beach in Cancun. Attention dads! This is also the only resort with a full-sized, on-site golf course. 7) Moon Palace – This classy all-inclusive resort about a half hour from Zone Hotelera offers families the best of both worlds: tranquil Riviera Maya beaches and easy access to terrific golf courses, Cancun shopping and nightlife. In the special Family Connection suites available only to guests with kids, multi-generational groups of up to six can relax together in luxury. 8) The Ritz-Carlton, Cancun – If you’re looking for the best in food, opulent accommodations, and a kid’s program that’s pretty impossible to beat, look no further than the Ritz. Here, luxury a la carte is above standard. 9) Riu Cancun Hotels – With four great hotels in different price ranges, all in the heart of Cancun, the Riu Cancun Hotels offer families an all-inclusive stay that includes a kids club, as well as great activities for parents and teens with just the right amount of luxury for your budget. 10) The Royal Cancun – Sheltered from the winds by Isla Mujeres, this cozy, bayfront all-inclusive resort offers some of the most family-friendly gentle surf on Cancun. And while the resort might be smaller than most, it still offers some pretty spacious villas where families can stay. Check out more choices for all inclusive family resorts.